Ordinarily my articles open with a quote that somehow pertains to the theme or message for that day. However when I sat down to write today’s article for the Gratitude Challenge, I realised that I would not be able to select a single quote that encapsulated how I felt about today’s topic of gratitude, which for this particular iteration of the Gratitude Challenge, is a treasured possession. Hence, this article is sprinkled with a variety of quotes, all sourced from this page, and are merely the tip of the iceberg about how I feel about books. The treasured possession which I am grateful is my book collection. The photo below is merely one of the bookshelves that Mrs C21stT and I have filled, and the bulk of the books in our burgeoning library came from my collection. I am immensely grateful for books and everything they bring with them. They are a source of joy and comfort, and can induce feelings across the full gamut of emotions. I was fortunate as a child, as I believe many of my generation were, that my mother read to me every night before bed, up until the age of four, or thereabouts. My memories of her reading Little Golden Books to me before bed, or buying me a book from the checkout when we did the groceries (I cannot remember the name of the series; they were square shaped, roughly as wide as a small envelope) when I had been well behaved were things that I distinctly remember looking forward to. Further, my mother was an avid reader, so our house was full of books and reading books for fun was modelled to me from a young age by not only my mother, but some of her closest friends. 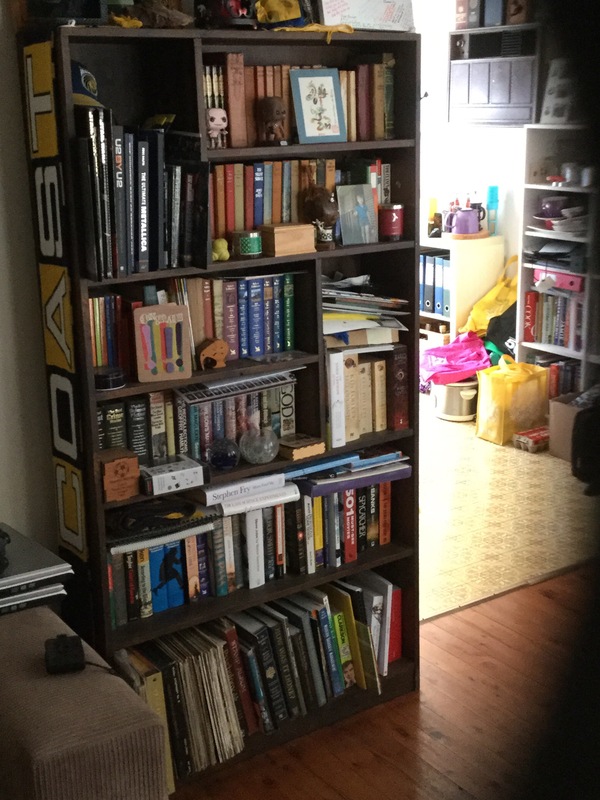 My Grandparents were also avid readers, and the top two shelves in the photo above are actually some of the books that Have been handed down to me since Pop’s vision declined to the point that books need to be audio books. As a child, I moved house quite frequently (when I moved out of home at twenty-two years old, I was moving out of my twenty-second house) and though I managed to make casual friends at each new school, it was my books that provided me with the friendship I craved, the adventure I wanted and the succour that I needed each time we moved house and I changed schools. When we finally returned to my home town and I was enrolled in what would be my school for years three to six, I set out to devour the school library, and made a solid effort of it. I think I aptly expressed how grateful I am for my books to the class I was situated in for my internship, a Stage Three class. There was a heartbreaking dearth of books in the classroom, with nary a bookshelf to be seen, and only a few books that were not dictionaries or textbooks on the shelves. I went through my own bookshelves and pulled out a wide range of books, around thirty all told, and made them available to the students to read. I introduced them by asking who wanted to do particular things; go into space, time-travel, explore the ocean floor, hike in the remote parts of the world, win wars, create amazing inventions, meet the genres as personalities, be invisible etc. Every student’s hand was up at least once. I then told them that I had done every single one of those things, and more, and rattled off in which book I had achieved which thing in the previous list. The student’s devoured those books over the remaining two months of my internship, books including The Invisible Man by H.G. Wells, Dinotopia by James Gurney, The Pagemaster by David Kirschner, Ernie Contreras and Jerry Tiritilli (though it must be acknowledge that authorship of this book is apparently controversial according to this Wikipedia entry and a range of others from varying genres and at different difficulty levels. Posted on August 14, 2015 August 14, 2015 by Brendan MitchellPosted in Book Week, Education, Gratitude Challenge, Literacy, ReadingTagged book week, gratitude challenge, Literacy, Literature, Reading.